A nice camp and pocket knife with good steel and a light weight. Best folding knife I've ever owned. Not too big, but big enough to do most anything around camp, etc. Mine is in my pocket every day, home or away. Comes literally razor-sharp in package. Now made with D2 tool steel, mine was made from 154 CM. Both materials very high-quality. Holds edge well; requires a little more time sharpening because of steel hardness, but worth the trade-off. Of special note is the patented AXXIS locking mechanism. It holds the blade as solidly as any folder I've ever held, or better. The blade doesn't feel any different in use than a fixed-blade knife, even after two years of frequent use. Yet, in spite of the solid feel, it's easily released with one hand and folded back into the handle. This locking mechanism is worth a five-star rating all by itself. Handle made of hard rubberized plastic, very durable, with checkered grip surface. Mine is yellow. Love it. Will include specific instructions for its dispensation in my will. Custom Mini-Griptilian (S30V): Well constructed, factory sharp knife. Handle gives good grip, and the opening hole (Pardue) is more comfortable than any other design. Purchased this through Benchmade's "custom" ordering process. The order was easy to specify precisely what blade, steel, and grips I wanted. Overall, the knife is light but well put together. 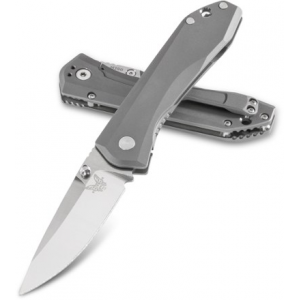 It's sharp and the S30V steel will keep its edge longer over other steels. My only complaint is that the handle is not "open" to allow dust and lint to fall through. I think this would have been an easy design change. 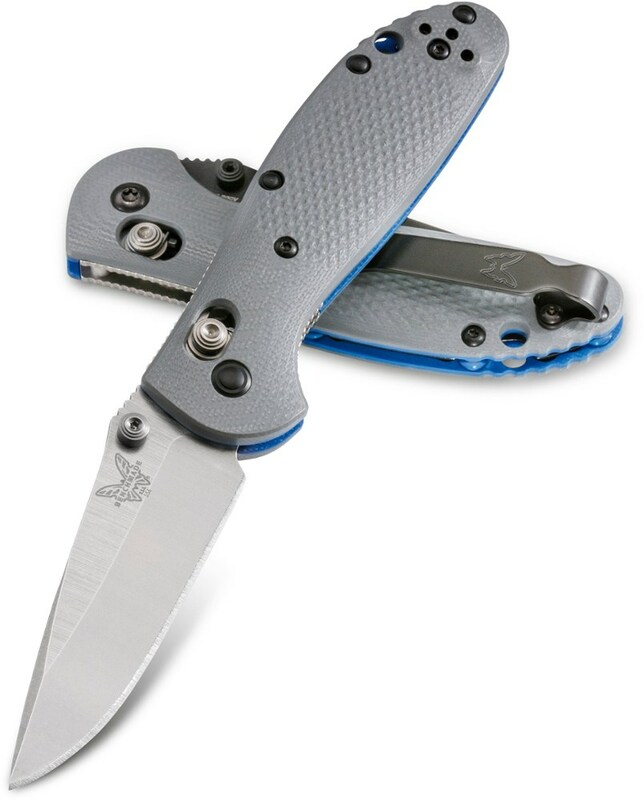 Mini-Griptilian is a solid folding knife. 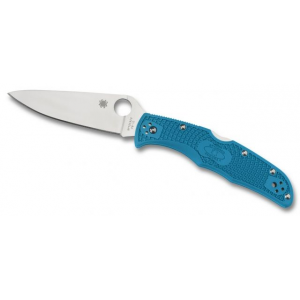 It was my second choice to the Spyderco Manix 2, and a very close second at that. Great knife for everyday use. Gets jammed with dirt and grit easily and the warranty is voided if you take it apart to clean it. I would recommend it for clean environments. one of my two all-time favorite small knives. mine is 154CM stainless, plain edge. it stays sharp but is reasonably easy to resharpen. the locking mechanism is fabulous, and it opens and closes easily. i like the hole in the handle and have a loop of webbing through it - useful for attaching to a carabiner, especially if i'm using it on a river. the handle is plastic - pretty good grip, perhaps vulnerable to damage, but i haven't even put a dent in it. 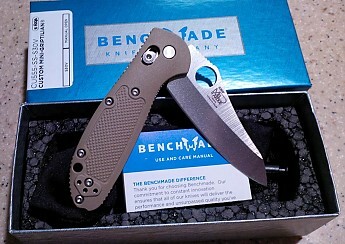 This was my first USA made Benchmade and I will say it's definitely worth the price. The axis lock is my favorite locking mechanism. This knife deploys just as fast as any of my assisted knives but it closes just as easy with just one hand. 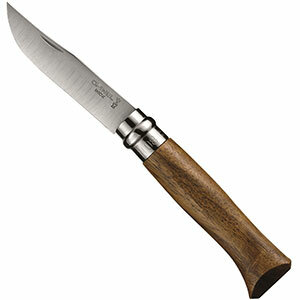 This knife has a great blade steel and great heat treatment. I was impressed with the smoothness and lock up of this knife. 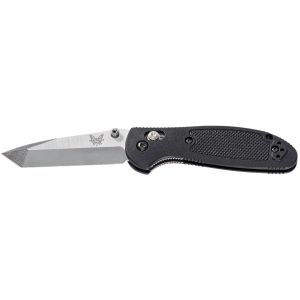 Overall it has great Benchmade quality, just with a more affordable zytel handle.